There may be a variety of reasons why you want to lower you student loan payments. Maybe you are physical therapist who is hardly making ends meet? I know how that feels! Between rent, food, our PT licenses, continuing education, car and gas, plus a $500 student loan payment and really, at the end of the day, you may be hardly making any money! Or maybe you are on the other spectrum, where you are trying to go for public service loan forgiveness, and want to lower your loan payments so that you will be paying less over the life of your loan. What ever is your reason for wanting to lower your payments, here is the top article to show you not just WHAT are the ways to lower you payments, but HOW to lower your student loan payments! In my opinion, these are the top ways to lower you loan payments. This is in the order of what I recommend as well. 1.Decrease your taxable income through retirement savings. Student loan payments, if you are on an income based repayment plan, are made up of a certain percentage of your “discretionary income”. Your discretionary income is found by calculating the poverty guideline for your location and family size. You then multiply that by 1.5 times and subtract that from your adjusted gross income (1). If you want a great calculator for finding out what your discretionary income may be, just go here. For example, the Pay As You Earn Plan (PAYE) requires that you pay 10% of your discretionary income. So to lower you student loan payments, you can’t change your poverty guideline or your family size, but you can change your adjusted gross income! The benefits are 4 fold using this method! You are getting the benefits of the stock market! Hopefully this money will grow by 5-10% and you’ll be not only paying less money to taxes and loans but also be making more money on your investments! You are saving for your retirement and you will be more prepared in the future! You are decreasing your student loan payments! Create an IRA account if you don’t have one yet. There are many companies out there like Fidelity or Betterment. Try to contribute what you can to the traditional IRA. If you can max this out, it would be best! Go to your employer’s website and go their 401K program and see what your current contribution level is at. Try to see if you can increase this limit to at least 10%. If you could max out your 401K that would be best as well, to try to maximize your tax savings as well as the reduction in loan payments. Create a HSA account (often through your employer) and see what your potential health costs may be and if you can contribute to this as well. You likely won’t get as much reduction in taxes with this method as the other two as this account is often smaller in size. Remember that these recommendations are based off your goal to lower your student loan payments. Before doing these actions, think about what you can afford to live on, your potential upcoming expenses, and how much you need or want to lower your payments by. I’m also going to add a disclaimer that I’m not a tax advisor and so I encourage you to consult with your tax professional for further details on these subjects. You simply may be on the wrong student loan payment plan and as result are paying too much money towards your loans! 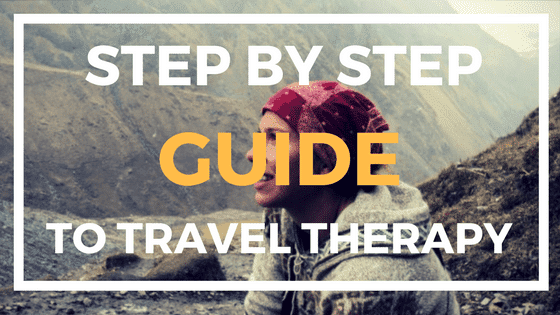 If you are in the wrong plan then this is a super easy fix! To know what plan you are in, go to your loan servicer website or look it up on your paper work. It should say something like “PAYE/Pay As You Earn” or “Income Based” or “Standard”. If you are in the PAYE plan, that is the best and lowest paying plan so you can move on from this step and go to step 3 which is to try to refinance your loan. If you have REPAYE or another plan, then you may be able to move different plans. Now this will vary based on when you took out your loans and even the type of loans you may have. 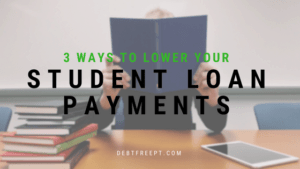 To figure out if you can lower your student loan payments and switch plans, you’ll have to do some digging and read up on your current plan and others out there but also call your loan servicer and ask them. I would advise that you research as well as call them because I’ve had mixed experiences with the help from my loan companies and I do not always trust their recommendations. If you are allowed to switch companies, you’ll likely just have to submit a form or piece of paperwork requesting that particular payment plan and potentially a pay stub or your tax return so that they can calculate your new loan amounts! First, I must explain what is refinancing! Refinancing, in a really quick explanation, is where you take your private and/or your public loans and combine them into a new private loan. Note that I said private loan. Only private companies refinance. When you refinance and clump your loans into one mega loan, you then should be able to get a lower interest rate for your new mega loan. 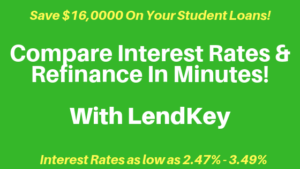 For example, I ran through the numbers using Lend EDU and got an interest rate quote of 2.5% for someone who had graduate loans of $100,000 with little assets and only an okay credit score. When I graduated, my loans from PT school were public loans with an average rate of about 7%! That means by refinancing, I could have saved 4.5%!! On a $100,000, that’s over $4,500 a year I would have saved simply by refinancing! Now there are pros and cons to refinancing. For example, you now have a private loan so all your potential public loan special privileges are lost. So if you ever wanted to get Public Service Loan Forgiveness, you couldn’t. So this method is really best for someone who truly knows that they want to pay off their loans. Going back to our calculations, you can see that simply by refinancing a $100,000 loan you could dramatically lower your interest rate. That decreases your student loan payments because included in your payments are the interest payments. So when you decrease your interest, you are decreasing your payments. Take my example savings of $4,500…I’m lowering my annual loan payments by roughly $4,500 by refinancing and lowering my interest rate. Now this assumes several things for the simplicity of this example, but you can see how if you had loans for 5-10 years, that this savings is MASSIVE! If you are interested in getting a quote to find out what your potential refinance rate could be then I recommend using Credible, LendEDU or LendKey. These services will be able to provide you an refinance loan comparison without any obligation or affect to your credit score. These websites simply compile the top companies and in just about 2 minutes comes up with the potential rates you would get based on various factors such as your loan size and your earnings, so that you can choose the best company to refinance! Each way comes with pro’s and con’s. Refinancing is going to be a more permanent way of changing your loan payments and is a one-time action, while retirement contributions can continuously be adjusted and have to be performed each year. Now, I’m not saying “lower your payments” or “don’t lower your payments” in this article. 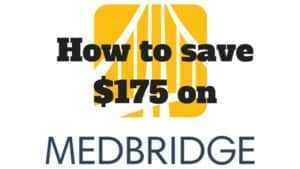 This is simply a step by step of how you could reduce your payments if you desired. Remember that with every action comes a consequence and so do your homework to make sure you have a good reason for trying to lower your payments and that if you do follow the above steps – that you can afford to contribute to your retirement accounts for example, or that you understand what refinancing is. I’m always here for you! If you have any comments or questions, simply type them below or hit the lightening bolt to the right of the screen to chat directly with me! Lets get debt free and take back our lives from our loans!